After three highly successful films into Catholic child abuse in Ireland, Brazil and the USA, Sarah Macdonald and Make World Media will focus their attention in the UK, and make a new documentary about sexual abuse by priests and religious of the Roman Catholic Church in the United Kingdom. ‘Crime & Cover Up’ will be one of the first documentaries of its type to be funded on the crowd sourcing website Indiegogo.com. The campaign will go LIVE on WEDNESDAY 15th MAY 2013 for 60 days and the team hopes to raise $100,000USD for the film. 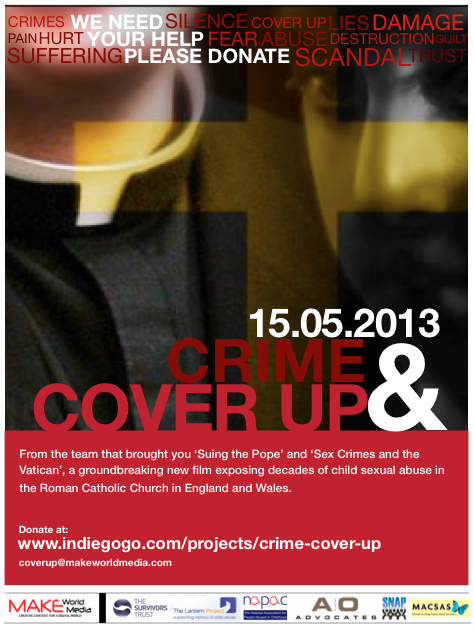 ‘Crime & Cover Up’ will expose the true scale of widespread, systematic child abuse that has remained hidden within the Catholic Church in England and Wales for decades. To date, there has never been an appropriate, independent statutory investigation into Clerical sexual abuse in the Roman Catholic Church in England and Wales. For more than a decade Roman Catholic leaders in England and Wales have insisted that they acted early to address this issue and properly protect children in their care. But we know this isn’t true. We hope this documentary will expose the shocking truth about abuse by priests and religious in diocese all across England and Wales and force the British government to implement a statutory, entirely independent inquiry into the scale of clerical sexual abuse, and legislate for mandatory reporting of child abuse within schools. Currently schools in England and Wales’ child protection policies are based on ‘guidelines’ only and not on laws requiring mandatory reporting of all concerns to the relevant state authorities. This isn’t a story based in the distant past; it’s a story of abuse and cover up that post dates the revelations in the USA, Ireland and across the Roman Catholic World. These revelations will reignite the scandals that have dogged the Roman Catholic Church over the past twenty years or more and one which will challenge the newly elected Pope Francis to respond to clerical crimes. ‘Crime & Cover Up’ will bring together a team critical in breaking the silence surrounding Catholic child abuse in Ireland and the USA. Award-winning investigative journalist and filmmaker, Sarah Macdonald will be supported by Colm O’Gorman, survivor of clergy child abuse, author and renowned human rights activist. Father Tom Doyle, a world renowned canon lawyer, and Dr. Ann Olivarius, managing partner of law firm AO Advocates, also lend their full support and expertise to the film. This is a global funding raising campaign for a documentary with global repercussions. Funding this documentary will be a large step towards gaining full recognition for all victims of Clergy child abuse worldwide.